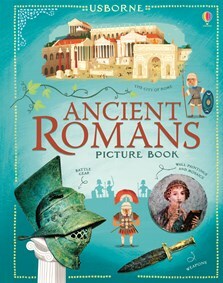 A colourful information book packed with illustrations and photographs that bring the history of Ancient Rome to life. Brightly illustrated pages describe how the Romans entertained themselves, the fashion trends they followed, why the Roman Empire fell apart and much more. With pictures of fearsome weapons, magnificent buildings and ancient artefacts on every page. Includes a contents list and index, and internet links to websites to find out more about the Romans. An inspiring history book for home, school and library.